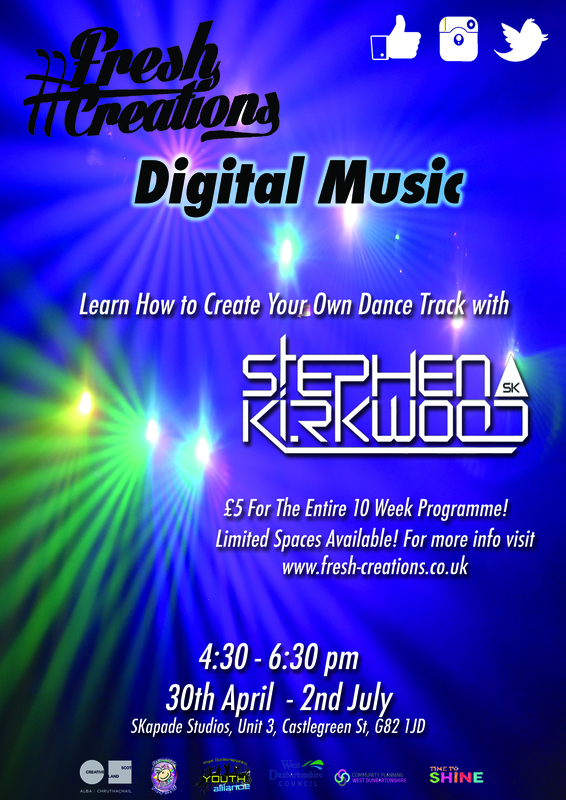 Our first Digital Music class begins the 30th April!! Please Note that this class is fully booked up. Check our website and Facebook page regularly for updates on future classes. This will involve getting to know each other, what sort of music everyone likes, what sort of track you would like to work on. A quick look at how music is constructed, a look at the instruments and computer programs used. Beginning to construct the track, getting set up & building melody ideas. Working on key boards and further construction of the music track. Recording vocals, adding drums, bass etc. Adding any additional musical elements, getting each section to sound perfect. In finalizing the track, we will focus on ensuring the track is sounding ‘loud’ enough to compete with other dance music tracks out there. A final glance at the track to make sure it’s perfect, looking into mastering the track so it competes with other professional tracks. Learning about sending the track to record labels & how a record label works. How to get your music onto itunes & YouTube. How to promote yourself online via YouTube, itunes, Facebook & more. An opportunity to play the track in a professional club environment. If you have any questions please get in touch with us at info@fresh-creations.co.uk. Is there any availability left for this? Hi Kerry, it is unfortunately full. However we do have another class that is about to begin. We’re holding an info night on Wednesday from 6:30-9:00pm to join a music class that focuses on making & Producing music. For more info, please look at the ‘music’ section in ‘classes’ folder through the website.